I normally try to steer clear of opinion pieces of Americans because I don’t want to be exposed to more negativity. But I clicked on this one. I’m thankful that I did. While it saddens me that it happens at all, I’m also happy to know that I’m not the only one put on the spot when something horrific happens in the USA and an Australian thinks I represent the entire nation – as if I’m to be held accountable for every sickening act humans do to themselves and others. I’m pleased to know that I’m not the only one who has an internal struggle raging between devotion and disappointment – wondering how do I reconcile those conflicting emotions. This writer expresses her dilemma well and it’s an interesting read. There are no answers, but the questions are universal. I’m glad that I’m not the only one asking them. 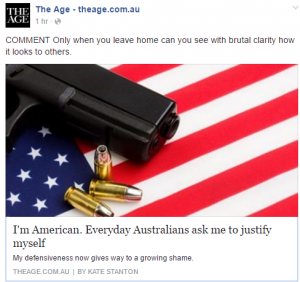 Share the post "American in Australia"
Categories: Culture shock, Homesick, USA, What the...?